Bergamo train station is located in the south Eastern part of the city, in an area called Piazza Guglielmo Marconi. The station was first opened in 1854 and now connects travellers flying into Bergamo airport with many major cities throughout Italy and Europe. // ]]>The train station in Bergamo provides an ideal gateway to many of the larger cities and towns in Italy and is the terminus for lines from: Brescia, Lecco, Seregno and Treviglio. Brescia in the recommended line for passengers wishing to reach Lake Garda, Verona and Venice. The rail network in Italy is generally very efficient, econimical and runs ontime. 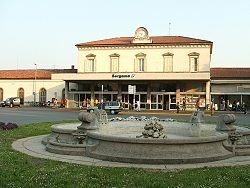 Although Bergamo airport does not have a direct rail link, the train station in Bergamo is within easy reach of the airport and only takes 10-15 minutes on the Bergamo bus. Buses leave from the airport to Bergamo every 30 minutes throughout the day and connect passengers to the train station. The number of the Bergamo bus in number 1 and the bus drops passengers outside the train station and then also collects passengers from outside the railway station to take them back to the airport. 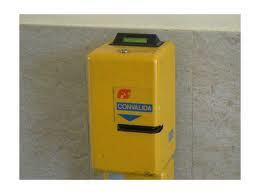 Before you travel on any train throughout Italy, you will need to purchase a ticket. Once you have purchased your ticket, before you board the train, you will need to validate it. This is a simple process and can be achieved by inserting your ticket into one of the yellow ticket machines on the platform. There is a direct train that runs from Bergamo train station to the Central station in Milan (Milano Centrale). This service runs hourly throughout the week days and alters at the weekend. The journey from Bergamo train station the Milan is between 40 and 50 minutes and is a very viable option for travellers wishing to visit Milan. another service that runs to Milan Porta Garibaldi station which takes a little longer and stops and many more stations than the train to Milan Central. It is always advisable to check before you board the train as to which station in Milan is the final destination. However, Milano Porta Garibaldi and Milano Lambrate are linked by public transport, so even if you did catch the wrong train, you could quite easily make your way into the centre of Milan using the Metro. Having a train station in Bergamo, means that passengers flying into Bergamo airport can reach most of the major cities in Italy by train. In fact, it is possible to travel to most major European cities by train from Bergamo airport. Passengers wishing to travel to many of the major cities from Bergamo train station, will first need to make their way to Milano Centrale station, where they can then catch a connecting train to the larger cities.